Nearly 40 percent of the world's population resides in China and India, so when bilateral relations are discussed, the relationship of these two neighbors is of unique importance. 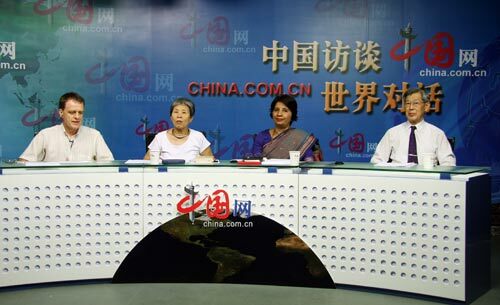 With the Mandarin translation of "The Good Boatman", a chronicle of the life of Mahatma Gandhi, soon to be released, China.org gathered a panel to discuss India's independence leader and the current state of Sino-Indian relations. 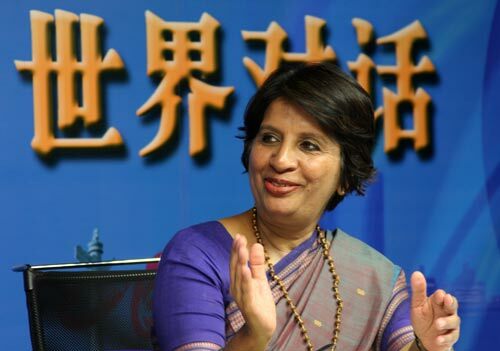 "Even though [Gandhi] had not visited China, he had a vision of India-China friendship," said Nirupama Rao, India's ambassador to China. "He stressed the importance of harmonious relations between our two countries, and said that it was extremely necessary for us to have such harmonious relations because it would be good for our continent and the world." For some politically aware readers, it might seem that tensions over border disputes and trade policies dominate the relationship between the two nations. Recent troop -movements and development initiatives on both sides have caused flare-ups over the disputed Arunachal Pradesh region. But the panel members believe these disputes receive too much attention. "For the Westerners, sometimes they pay more attention to the differences in the governance of these two countries," said Zhou Gang, former Chinese ambassador to India. "We share so many things in common. The similarities, the common points, outweigh the differences. "No two countries in the world are the same in every aspect." Ambassador Rao agrees. "There is immense potential for cooperation and it is happening." Former Ambassador Zhou's wife, Deng Junbing, translated "The Good Boatman" after receiving a copy as a gift from the Mahatma's granddaughter. "As a good metaphor says, China and India are like a dragon and elephant dancing on this globe, and I think the dance will be beautiful," she said. China and India both came into their current forms of statehood in the late 1940's. They are among the world's most rapidly developing countries, but a major difference remains in their forms of government. India is a Western-style democracy, having formed itself largely on the British model. Two years after India achieved sovereignty, the People's Republic of China was formed, with a government based on communist principles. The economy opened in the late 1970's, which has led to rapid economic growth. Again, the panel emphasized that focusing on the differences between the two countries was the wrong approach. "By studying each other more closely and respecting the fact that there are differences between us, there is a certain dynamism and a certain energy you can bring to this dialogue," said Ambassador Rao. "Both our countries have a lot to learn from each other." She continued by tying the discussion back to the book about Gandhi. "We in India and China have to regard ourselves as 'good boatmen'. I think we are rowing this boat together and there is this river we are going down. We have to take the people in the right direction as far as this friendship and partnership is concerned."